Storyinworship.org is a website dedicated to searching out and sharing great stories that are well-suited for worship and religious education. I am a Unitarian Universalist minister and I use all kinds of stories to engage adults and children in worship services. I’ve written a book sharing everything I know about telling stories in congregations, but I find myself always looking for another great story to help young and old wrestle with some religious or spiritual question. Whatever your religious tradition, if you lead worship or teach children, you are probably looking for that next great story, too. Many of our religious traditions have wonderful stories we return to again and again, but a fresh story can help us see and appreciate our tradition in a new way. And, when we enter a story together, we share an experience of meaning making. There are a lot of stories in the world but finding stories appropriate for religious community can be tricky. The stories need to reflect our values and they need to be engaging (or why tell them?). Each year, this site will highlight a couple dozen good quality stories, reviewed by myself and guest reviewers. Each review will be added to a searchable list of stories – all chosen because they are stories that will work in a worship service. We already have several reviews published. You will find brand new picture books, ancient folk tales, and well-loved classic stories. Each review will offer basic information about the plot, the characters, and the theological or moral themes it explores. So check back often. This is going to be good! 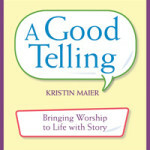 And, if you need a handful of great stories right now, check out my book A Good Telling: Bringing Worship to Life with Story.